The movie pulled in $1,167 on average at the 1,648 theaters across the country it was shown in. It made $1,922,300, meaning it was the 11th-highest grossing movie in the country. It is number 79 on Box Office Mojo's list of Worst Opening Weekend by Per-Theater Average since 1982. Industry observers criticized the movie's performance on Monday. Time said the movie "fizzled in its wide expansion." Fortune described it as struggling. The Los Angeles Times said Miss Sloane failed to meet "an already lackluster" projection of $5 million for the weekend. "EuropaCorp expanded the terrific Jessica Chastain vehicle Miss Sloane into 1,648 theaters over the weekend, with just tragic results," Scott Mendelson wrote at Forbes. "Unless Jessica Chastain ends up with a Golden Globe nomination and/or an Oscar nomination in a robustly crowded ‘Best Actress' field, this one is finished." 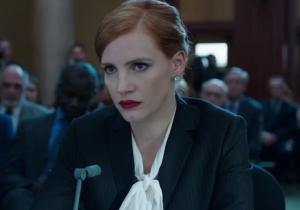 Miss Sloane‘s story follows a lobbyist, played by Chastain, who joins a firm working with the Brady Campaign to Prevent Gun Violence to get new federal gun control measures passed despite opposition from the "gun lobby." The movie has garnered mixed reviews, with praise for Chastain's performance despite complaints that the plot is too unrealistic. The film currently has at 69 percent fresh rating on Rotten Tomatoes. The poor opening did not stop the Brady Campaign from championing the film in a live-streaming event on its Facebook page. The organization featured discussion with Kris Brown, one of the group's lobbyists, about how the movie compares to real-life lobbying for gun control. The group, which consulted on the production of the film, said they were open to participating in more projects with the makers of Miss Sloane as the movie continues in theaters. Brendan Kelly, press secretary for the Brady Campaign, said the group's work on Miss Sloane represents a new frontier in its work to influence Hollywood on gun issues. "Miss Sloane marks another chapter in Brady's partnership with Hollywood to integrate the realities of gun violence into entertainment," Kelly said. "We've consulted on scripts for powerhouse television shows including The Good Wife and Grey's Anatomy." He said the group considered Miss Sloane a success regardless of how it performs at the box office. "While I'm not qualified to forecast how a film will perform, I can tell you that its production alone, with our input, is the success," he said. "It's a big step in this trend we've seen with the entertainment industry taking on this topic, whichever side of the debate you're on. It's furthering the national conversation we should all be having—that's the success." Gun rights activists, on the other hand, had a different view of Miss Sloane‘s box office numbers. "Gun owners always knew the movie was—pardon the pun—a dud," Alan Gottlieb of the Second Amendment Foundation said.